I have previously laid out the framework and methodology for testing the stability of tripod legs. Of course, the legs cannot be used by themselves; a head is necessary to point the camera in an arbitrary direction. Ultimately then, the stiffness of the combined head-leg system is going to support the camera. Here, I am going to lay out the methodology for testing tripod heads and treating the system as one. To measure the stiffness of a head, I am going to place it on a tripod whose individual stiffness has been measured beforehand. Then, by testing stiffness of the combined system, we can back out the stiffness of the head. So calculating the stiffness of the head is a simple matter of measuring the stiffness of the combined system and the tripod alone. The measurement error for the head is calculated using propagation of uncertainty and the standard error from repeated measurements of tripod and combined system. To minimize the measurement error, it is ideal to be using the stiffest tripod possible. Even better would be a massive steel block with a single 3/8″ screw to mount the head. Such a block would have effectively infinite stiffness compared to the head, and the measurement would be easy. But I don’t have a massive steel block lying around, and I don’t particularly want to make one. The stiffest tripod I have is the Gitzo 5 series systematic. The damping is so high on this tripod though that it makes doing accurate frequency (and thus stiffness) measurements quite difficult. The best candidate I have is the RRS TVC-33 which has high stiffness and relatively low damping. Naturally I will also not use the tripod at its maximum height to increase the effective stiffness. Below is an image of the test setup. 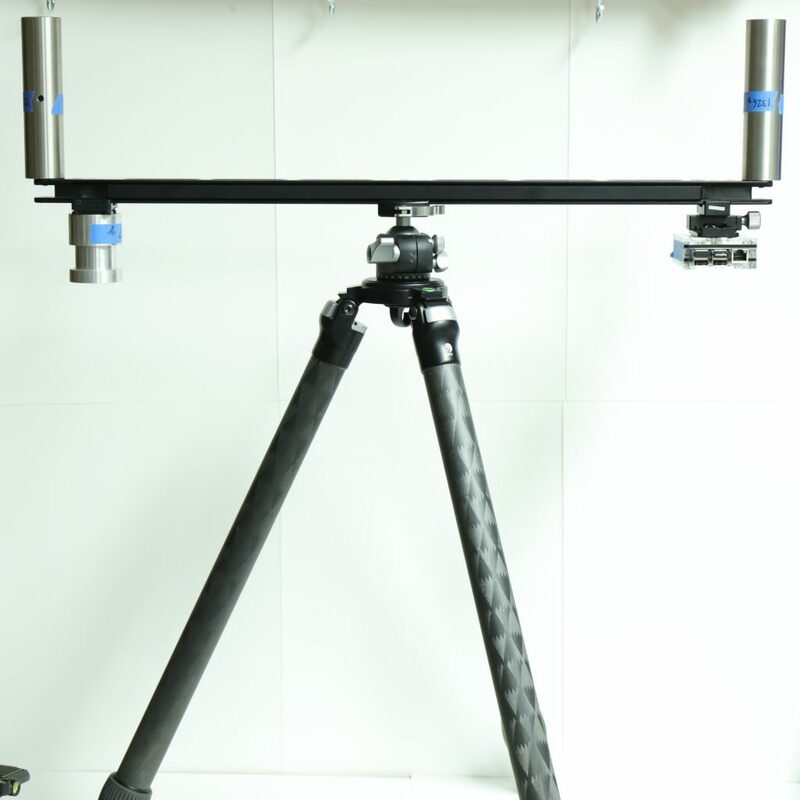 It is basically identical to the test setup for tripods, with the obvious exception of a head between the tripod and the high rotational inertia measuring unit. For this example test, I used a Really Right Stuff BH-40. The test data, with the head stiffness calculated using the above formulas, is below. The means and standard errors in this data are taken from 30 individual measurements for the tripod alone, and 10 individual measurements for the tripod plus the head. Being the first head that I have tested, its hard to provide too much commentary on the performance here. Given that its a Really Right Stuff head, its probably pretty reasonable. We can immediately notice that the head is much stiffer than the tripod. This shouldn’t be too surprising given that the head is more comparable to a block of metal than relatively flimsy long tubes. Of particular interest is that the radial (vertical camera motions) stiffness is significantly lower than the axial (horizontal camera motions) stiffness. We have seen in tripods that the opposite is true. I will be testing a number of heads, and it will be very interesting to see how the properties play out.